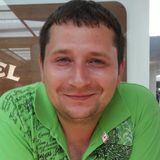 Yevhen Bit Blyzniuk, age 40, Ukraine, Dnipro. Mixing dj sets for my friends and people in the web since 2001. Using PC and Numark dj2go controller.